The churchyard at Dunleckny contains the ivy-covered ruins of two churches. 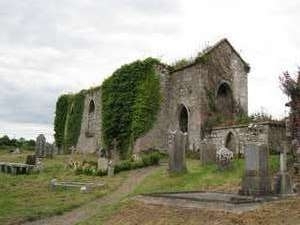 The detached three-bay, single cell Church of Ireland was built in the late eighteenth but abandoned in the early nineteenth century when services were transferred to St Mary’s Church, Bagenalstown. The ruin to the right, now almost completely covered with ivy is of a much older church. At the beginning of the thirteenth century this church was granted to the nunnery of Graney. The present remains consist of a rectangular structure which is probably medieval in date. In the older church is a plaque to the memory of two eighteenth-century parish priests. It was erected by Fr. Michael Pendergast in 1810 and commemorates his uncle and grand-uncle, both, like himself, priests of Dunleckny. This reveals a typical tradition of priesthood within Irish families. 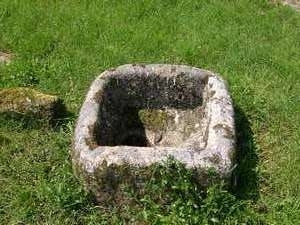 A large, almost square, granite font is situated to the right of the entrance gate. The burial ground around the church contains many interesting gravestones. There is also a private graveyard for the Bagenals and Veseys of Dunleckney Manor. 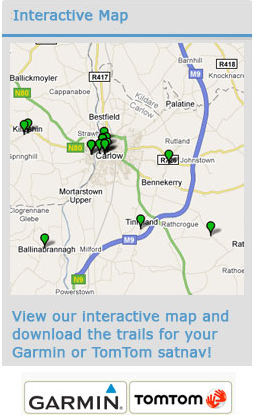 Walter Bagenal founded the nearby town of Bagenalstown in the 1700s. He had visions of mirroring the city of Versailles in northern France and built a grand courthouse and some public buildings. Shortly after his efforts were frustrated by the re-routing of the coach road away from the town. His courthouse is now the town library. Single-cell church: Simple structure without aisles or projections.